Robin Hood follows Robin of Loxley (Taron Egerton), a war-hardened Crusader, and his Moorish commander (Jamie Foxx) as they mount an audacious revolt against the corrupt English crown in a thrilling action-adventure packed with gritty battlefield exploits, mind-blowing fight choreography and a timeless romance. Robin Hood is presented by Lionsgate’s Summit Entertainment and produced by Appian Way and Safehouse Pictures in association with Thunder Roads Films. Joseph Trapanese is best known for his sleek, ominous score work for blockbuster films like Tron: Legacy, Straight Outta Compton, Oblivion, and the Raid series. Other notable scores include the hugely-successful musical film The Greatest Showman (2017), the second and third installments of Lionsgate’s Divergent series, Insurgent (2015) and Allegiant (2016); Earth to Echo (2014); and Ubisoft’s video game The Crew (2014). As a composer, arranger, and producer for movie, television, theater, and video game music, he has collaborated with a number of mainstream musical acts including Daft Punk, M83 and Moby. In the studio and in concert, he has also worked with Dr. Dre, Zedd, Kelly Clarkson, Kendrick Lamar, Haim, The Glitch Mob, Active Child, Halsey, Sohn, John Newman, Dia Frampton, 3OH!3, Steven Price, and James Newton Howard. 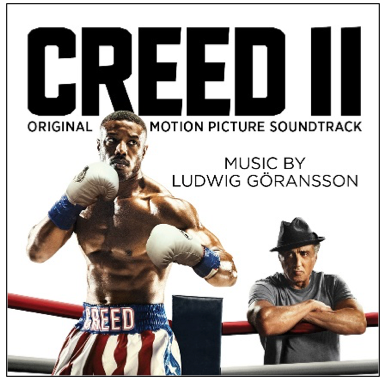 Metro Goldwyn Mayer Pictures (MGM) and Warner Bros. Pictures’ Creed II is directed by Steven Caple Jr. and stars Michael B. Jordan and Sylvester Stallone reprising their roles of Adonis Creed and Rocky Balboa respectively. Also reprising their roles from the first film are Tessa Thompson as Bianca, Phylicia Rashad as Mary Anne, Wood Harris as Tony “Little Duke” Burton, and Andre Ward as Danny “Stuntman” Wheeler. The new cast is rounded out with Florian “Big Nasty” Munteanu as Viktor Drago, Dolph Lundgren returning to the role of Ivan Drago, and Russell Hornsby as Buddy Marcelle. Caple Jr. directs from an original screenplay co-written by Stallone and Juel Taylor, story by Sascha Penn and Cheo Hodari Coker, based on characters created by Sylvester Stallone. The film is produced by Irwin Winkler, Charles Winkler, William Chartoff, David Winkler, Kevin King-Templeton and Stallone. Ryan Coogler, Jordan and Guy Riedel are executive producers. Creed II will be distributed theatrically in the U.S. by MGM on November 21, 2018, and Warner Bros. Pictures will distribute the film internationally.